I gasped when I saw this picture. That looks like heaven! Just out of interest, in what situations would cars use this path? It's not close to where I live (230km), but when I go there it would be nice to be able to find this route. I'd better ask Maarten myself or look at his website. Sam: I've not seen this actual road myself, so I can't say for certain what the situation is on this road. However, based on previous experience of such a setup I would expect that drivers will use the road for access only. There are perhaps a few houses along the road, maybe even a small business or a farm. So you may shared with a tractor sometimes. OK. Now I'm officially jealous . . . I was wondering how these were used. I think it's similar to the Feldwege we have in Germany in terms of rules and use. They would be perfect for our town but under the current local government I'd hesitate to suggest we repair them: as soon as they notice it's more convenient than the current route for cars they'd make them into a road. I found one. 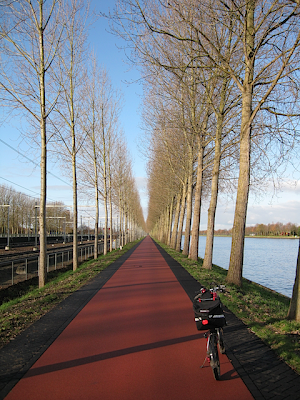 Here's a photo of a bicycle road in Oldenburg. From the descriptions on the various photos it seems that they've varied their ideas about how this should work in Germany - or at least in this location.